Staying in San Antonio puts you where the action is, downtown, the famous Riverwalk, and walking distance to many sights and sounds. Magic Savings Tip: Check with your hotel for coupons when you check in to local area restaurants. You can also purchase what’s called an “entertainment book” that includes tons of buy one get one free meals and meal items as restaurants. The most famous site in San Antonio is by far The Alamo, where in 1836 the small adobe church was the scene of one of the most famous battles in US history. Colonel Travis, Davie Crocket, Jim Bowie and many others gave their lives defending the Alamo and Texas against the Mexican Army of Santa Anna. Today you can walk the ruins, and stroll the grounds and rooms of these historic grounds, and feel the presence of these heroes’. One can almost hear the battle, the cannon fire and Mexican bugles. After viewing the Alamo, take a walk nearby to the historic village of Alamo to La Villita, for some shopping and lunch. 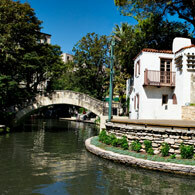 Stroll the famous San Antonio Riverwalk, with its exciting shops, restaurants, galleries and museums. This area is a wonderful experience both during the day and evening as boats cruise up and down the river. You can even choose to arrive at your destination restaurant by water if you choose. Visit the San Antonio Museum of Art during your stay, which is located on the Riverwalk. Take a Segway tour of San Antonio’s famous sites. It’s not as difficult as it looks, with instructions in a safe area before taking off on the adventure. The cuisines of San Antonio are widespread, and your taste buds are sure to party with such delights as real Tex-Mex, Italian trattoria and even an occasional French Bistro. You can enjoy your restaurants wine list featuring wines from the Texas Hill Country, and you’ll be surprised at what comes from the bottle. For “fine dining” reservations at the Antler’s Lodge for you and your partner will have you both in a romantic mood, and satisfied beyond belief with the American Cuisine. It’s not McDonalds for sure, so expect a hefty fee for this evening. The Alamo Café is an adventure for your taste buds, featuring original authentic Tex-Mex foods. Enjoy family friendly prices, and if you enjoy chicken fried steak, you have to try theirs. Their fajitas are sizzling way before you see them, but you know their coming as the aromas race the sound to your senses. Lastly but not least, you’re in Texas, so why wouldn’t we suggest some barbeque? There are a few good choices, but Augie’s Barbed Wire Smokehouse comes highly recommended by locals and visitors as well. Now don’t be expecting anything fancy, this may look like a hole in the wall, but you’ll know it’s the ”bomb” when you see the lines. A great place for lunch or dinner, and located close to the San Antonio Zoo. Some of the best adventures outside San Antonio are in the Hill Country north of town. You may decide to visit some wineries and sip some nectar while enjoying lunch in the vines in Fredericksburg. Visit Bandera, the Cowboy Capitol of the World, and take a trail ride and or visit one of the guest ranches for a Ranch Rodeo. If you go on a Saturday between April and November, you’re in for a treat, with “Cowboys on Main”, a live performance in Courthouse Square. Feed me well San Antonio! Every army - and every tourist - marches on their stomach! Issue being unless you know the ins and outs of the city you're visiting, it's very easy to come away with some very hum drum meal experiences. Take our tips and explore San Antonio with a happy - and full - stomach. Go to Cheaprooms.com and find an excellent value San Antonio package from the range of hotels and packages on offer. If history is your thing, Texas and the Alamo have plenty! Find cheap accommodation in San Antonio now and save your money for all those culinary adventures. Let's start with brunch - the breakfast choice of champions - at El Jarro de Arturo on 281 N. at Bitters. This is where you get Texan goodness on a plate with super size portions and a cheery atmosphere to help you on your way. It's not as fancy as some of the places on the Riverwalk, but the food is where it's at. Try the pork with spicy red sauce. This is Tex-Mex country so our recommendation is Rosario's in King William District on S. Alamo. They do an excellent take on the classic roasted tomato salsa. Combine that with the shrimp nachos and then tacos nortenos. It's a big, brash, noisy, crowded place on a Saturday night though - so if you're looking for a romantic night for two, this ain't it. If you're after a special night out to cement your stay in San Antonio then fancy food in the form of Biga, La Reve and Las Canarias on the river are all good - quality restaurants that won't leave you feeling ripped off by a 'tourist price' for an ordinary meal., and the glamor of a river restaurant to boot. 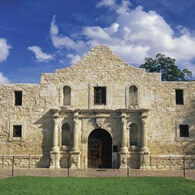 The Lone Star State is full of national historic sites and monuments - none more so than the Alamo in San Antonio. But other attractions await the adventurous and they're well worth the extra effort in getting to see them. Go to Cheaprooms.com and secure a cheap hotel deals in San Antonio to suit your family needs. Some attractions will need a hire car so make sure you get one at the airport. 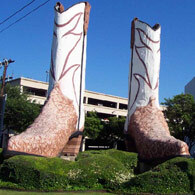 Find cheap accommodation in San Antonio now and go beyond the Alamo in San Antonio. For something a little different in San Antonio, go to the SeaWorld park and enjoy the combination of animals, rides and shows. There's a new Aquatica waterpark for the children, plus shows and entertainment daily. If you like to bring back a souvenir from your trips, consider a visit to the Blue Star Arts Complex at 116 Blue Star San Antonio. The huge old warehouse has been transformed into a buzzing gallery space with many recognizable names displaying selling their art. To make the trip here even more enjoyable there's a little craft brewery on site plus theaters and play spaces. The River Walk at night is a busy, happy place full of bars and restaurants - but which to choose when you're from out of town. The locals like Durty Nelly's Irish Pub at 200 S Alamo St, mostly because of pianist who takes requests, but also because peanuts come in the shell and you can break 'em open and toss the carapace on the floor. True story. For some real Texas-style entertainment, visit Far West Rodeo at 3030 North East 410. The food's great, the beer cheap and they run a nightly rodeo. Watch the locals take a few spins then try it yourself! San Antonio in the winter months is blessed with a climate that enables the visitor o still enjoy all the great outdoor attractions that San Antonio is so famous for - with the harsh extremes of the summer heat. Go to Cheaprooms.com and get yourself to San Antonio with a cheap hotel packageto suit your budget and group size needs. Of course it always pays to check the weather forecast for San Antonio before you come so you know what you're in for. Find somecheap accommodation in San Antonio and get ready to enjoy the great outdoors, Texas-style. The River Walk is a four mile loop that has turned downtown San Antonio into one of the most delightful cityscapes in the south. The towering trees and quaint overpasses, the cobblestoned annexes and fascinating little shops and boutiques have turn the city into a mecca for those looking for something different than the standard downtown fare. Head upstream to the Pearl Brewery complex and venture south towards the King William Historic District. Have you brought the children? They will love the HemisFair Park area very close to the downtown area. Originally built to cater for the 1968 World's Fair, this delightful urban retreat encompasses 15 acres of rolling parkland, waterfalls and the 750-foot Tower of the Americas. History is a big part of San Antonio's attraction and the four Spanish colonial missions that make up the Missions National Historical Park are all linked by the San Antonio River and eight miles of paved cycle path. It's a delightful ramble through park and farmlands, through old neighborhoods and into the historic areas. Brackenridge Park is a mighty outdoor facility that marks San Antonio's place as a city that truly celebrates the great outdoors. This is 343 acres of trails, forest and parkland - and it's also home to the San Antonio Zoo. San Antonio's 'must see' attractions! San Antonio has history - and a wide selection of activities, including the Riverwalk to occupy your time. The good deals on Cheap Rooms will help get you there - now all you need to decide is which of the dozens of attractions you'll enjoy. Of course, San Antonio's great claim to fame is the Battle of the Alamo and its pivotal moment in the history of the Texas Revolution. It was a military disaster - after a 13 day siege just two defenders were left alive - but Santa Anna's conduct and ruthless efficiency served as a rallying cry for Texans and the rest, as they say, is history. The other big drawcard is the San Antonio River Walk which is lined with shops and restaurants, cafes and wonderful little nooks and crannies for you to explore. Take a boat - there are several to choose from - and see the Walk from the river. If you're lucky you'll hit one of the many festivals that promote the Walk. Arts and cultural attractions form a big part of the Walk and are often best seen from a cruise boat.